Among these postwar women politicians was Ellenore Bridenstine of Terry, who in 1945 became the first woman elected to the state senate. An active participant in the local Republican Party and the wife of the only physician in Prairie County, Bridenstine recalled her decision to run for office: “Many of my women friends felt that I was crazy to try for it. But I decided to try for it anyway just to see what would happen. The man holding the office had never campaigned, and I am sure that he felt he would not need to against a woman.” Bridenstine won her seat by a mere six votes but was reelected in the next cycle. In the late 1940s and 1950s several other women won seats in the Montana legislature. Some, like Republican Bertha Streeter of Lake County, elected in 1957, came to the state senate after holding local office. Many others served multiple terms. The number of women active—and successful—in local and state politics suggests that Montanans supported women’s political ambitions with their votes. 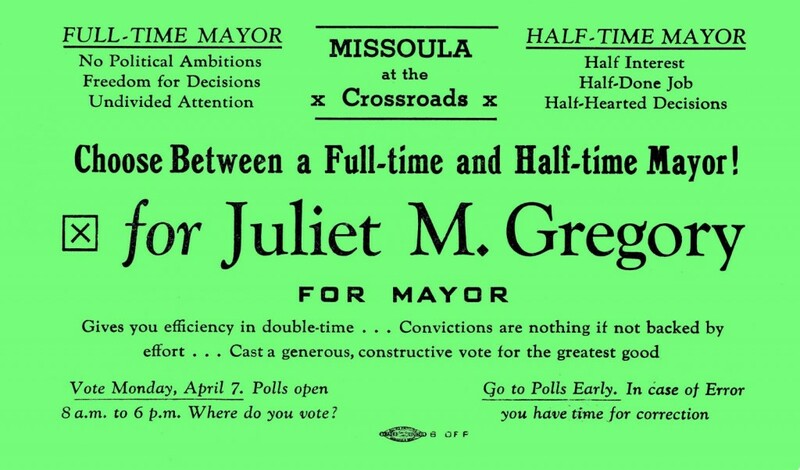 Historian Joanne Meyerowitz has found widespread admiration during the 1950s for “women who exhibited ‘devotion to the public good.’” The success of Montana’s postwar politicians fit this emphasis on female service. In general, female politicians worked within cultural stereotypes about women’s political capacities. During the Progressive Era, American women had carved out distinct niches in politics based on the belief that women were naturally suited to deal with certain social issues like education, maternal and child welfare, and public health. This “female dominion” of American politics, as historian Robyn Muncy has pointed out, was a place where women could exercise significant political power even as their authority was circumscribed by more powerful male politicians and bureaucrats. 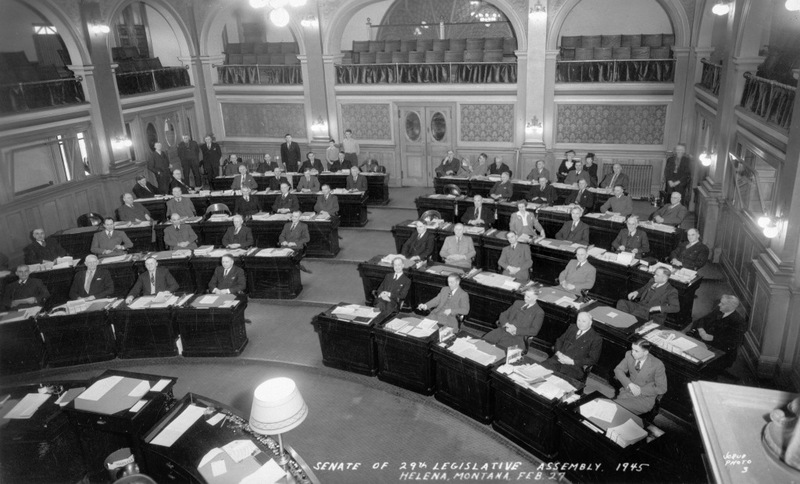 The work of Montana’s postwar politicians suggests that they operated within a similarly restricted context. Bridestine, for example, was given the chairmanship of the Sanitary Affairs (later renamed Public Health) Committee and the vice chairmanship of the Education Committee. These committee placements reflected Bridenstine’s personal expertise—she was a former educator and the wife of a doctor—but they were also areas traditionally associated with female reformers. Because she was from a rural county, she was also placed on the Agricultural Committee. In this traditionally masculine realm, Bridestine recalls that she was “promptly ignored.” Other female politicians followed a similar pattern. Bess Reed, a Republican from Missoula, also served as chair of the Public Health Committee and worked on public school reform. Even while working within the context of conservative gender roles, many postwar politicians avidly promoted women’s rights. As a member of the Republican state platform committee in 1942, Bridenstine pushed for a rule requiring that women serve as vice chairs on party committees. Bridenstine was also an ardent proponent of women running for office. Bess Reed too advocated for women’s political involvement. In a speech to the Helena Soroptimists, she decried the fact that women did not exercise the right to vote, saying, “It is a sacrilege that this privilege is taken so lightly.” Reed also strongly supported equal rights under the law for women, including the Equal Rights Amendment, a cause that Toni Fraser Rosell would continue to push through the 1970s. Read Ellenore Bridenstine’s account of her political career in “My Years as Montana’s First Woman State Senator,” published in Montana The Magazine of Western History 39, no. 1 (Winter 1989): 54-58. “Antoinette ‘Toni’ Fraser Rosell.’” Billings Gazette, April 28, 2011. Available online at http://www.billingsnews.com/index.php/back-issues/2669-antoinette-toni-fraser-rosell. Accessed July 24, 2014. “Bertha Streeter of Lake County Becomes Third Woman Senator in Montana.” Independent Record, November 8, 1956, 12. Bridenstine, Ellenore M. “My Years as Montana’s First Woman State Senator.” Montana The Magazine of Western History 39, no. 1 (Winter 1989): 54-58. Meyerowitz, Joanne. “Beyond the Feminine Mystique: A Reassessment of Postwar Mass Culture, 1946-1958.” Journal of American History 79, no. 4 (March 1993), 1455-82. Minard, Louise. “Rep. Bess Reed Has No. 1 Desk.” Montana Standard, January 16, 1953, 2. “Montana Legislature Hard Working Group of Citizens.” Helena Independent Record, February 22, 1953, 1. “Mrs. Bess R. Reed Speaker at Soroptimist Club.” Helena Independent Record, January 12, 1951, 10. “Nutter Criticized on Two Issues.” Daily Inter Lake, July 17, 1961, 1. Rosell, Antoinette Fraser. Interview by Bob Brown, July 6, 2005. OH 396-29, Bob Brown Oral History Project, Maureen and Mike Mansfield Library, University of Montana, Missoula. Available online at http://scholarworks.umt.edu/brown/58/. Accessed July 24, 2014. “State Legislator Rep. Bess R. Reed.” Montana Standard, January 22, 1951, 3. “Women Seek State Offices,” Billings Gazette, July 6, 1956, 9. “Women Elected Officials.” http://montanahistorywiki.pbworks.com/w/page/21639875/Women%20Elected%20Officials. Accessed July 28, 2014.